Volunteer community members implementing the on-street mural in the West End at a Cardero Street intersection, between Nelson Street and Comox Street . Image courtesy of Sonja Mulabdic. The West End On-Street Mural Project is a collaborative public art pilot project created with the aim of strengthening community bonds. This summer, it was organized by local artist Sonja Mulabdic, in collaboration with Viva Vancouver and the City of Vancouver’s West End Community Planning team. The inspiration for the project came from the City Repair Initiative which originated in Portland, Oregon. “By reclaiming urban spaces to create community-oriented places, we empower our communities and nurture our local culture,” says the City Repair website. 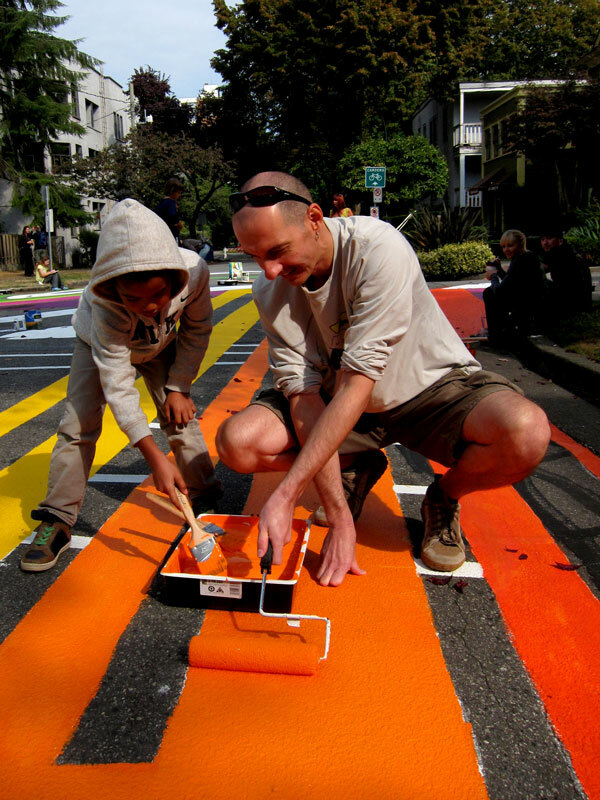 Already one of the most vibrant Vancouver communities, the West End has become even more colourful through the implementation of an on-street mural, located on a Cardero Street intersection, between Nelson Street and Comox Street. The goals of the West End On-Street Mural Pilot Project are to enhance community connectedness and to build strong bonds between neighbours, thereby contributing to the creation of a safer and more resilient neighbourhood. The mural, strategically placed on a designated bike street intersection, will help slow down vehicular traffic and encourage alternative transportation modes. 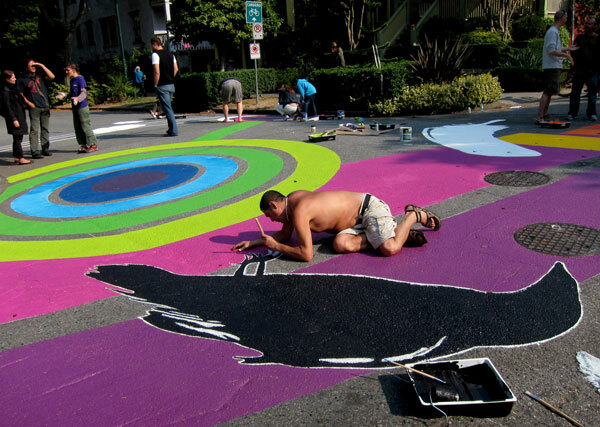 Organizers of this project hope that this vibrant intersection art will inspire pedestrians and cyclists to use Cardero Street more frequently. The project was initially introduced to the local residents on May 23rd, 2012. Between May and September, a group of West End residents met several times to collaboratively develop concepts and visuals that most closely represent the West End neighbourhood. “Nature/City”, “Vibrant Energy” and “Multicultural Diversity” were selected as main themes to guide the design development. Once the themes were chosen, Ms. Mulabdic developed an artistic interpretation of these concepts, and in August the community met again to select one of four designs presented to them. On Sunday September 23rd, 2012, the Cardero Street Place Making Initiative through the West End On-Street Mural Project had over 40 volunteers of all ages participating in the painting of the mural. It was an exciting, fun event which provided an opportunity for local residents to get together and participate in transforming one city intersection into a piece of public art. You can find more detailed information about this project at www.westendmural.wordpress.com. Volunteers of all ages participating in the painting of the mural. Image courtesy of Sonja Mulabdic. Sonja Mulabdic is a communications artist with extensive experience in illustration, graphic design and web design. As a design professional, she has worked with many organizations, small businesses and individuals that focus on improving community and the environment. Her previous large scale projects include Logger Sports Community Garden design at BCIT campus and the Parks in Streets project that was aimed at inspiring local residents to convert side streets into parks. Sonja has been active in many West End community organizations through her volunteer work. Looking forward to next year’s photo opportunities and street festivities.